Single-cup coffee makers appeal to customers who want an easy way to make coffee – there’s no measuring, no mess, and no dirty carafe to clean. But inside your coffee maker, gunk is accumulating. The damp, dark environment inside the machine is also a breeding ground for bacteria, so if you haven’t cleaned your single-cup coffee maker in a while (or ever), put that task on your to-do list. 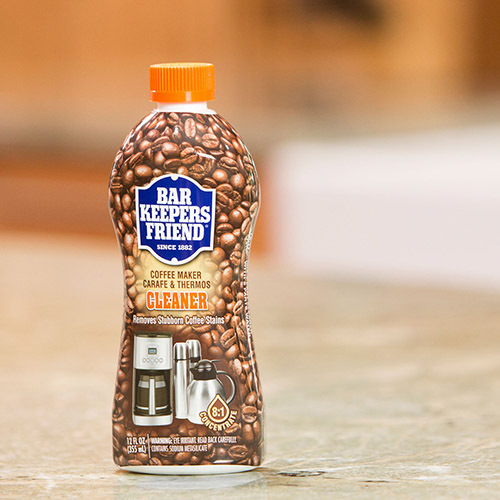 Bar Keepers Friend Coffee Maker Cleaner works best when machines are free of mineral deposits, so always use Bar Keepers Friend Coffee Maker Descaler before cleaning. Both products are safe for most surfaces, but cover your countertops before cleaning, if they are marble, granite, or natural stone, to avoid possible damage. If there’s any water in the reservoir, unplug your coffee maker and let it sit for about 30 minutes, so the water cools before you empty the reservoir. Remove any pod from your coffee maker. Slowly fill the reservoir (to avoid splashes and spills) with one ounce of Bar Keepers Friend Coffee Maker Cleaner for every eight ounces of cold water. Place a ceramic mug under the discharge. Initiate the brew cycle and repeat this step until you see the “Add Water” indicator, then allow the machine to stand 30 minutes, with the power on. Fill the reservoir with cold water and initiate the brew cycle to rinse the inside of the machine (repeat, as necessary, and dump any water that remains in the reservoir after brewing). Add fresh water before brewing your next cup of coffee. Descaling and cleaning your single-cup coffee maker improves the flavor of your coffee and removes oily residue that can harm your machine. Use Bar Keepers Friend coffee maker maintenance products at least every three months, to get rid of grime and build-up. Always refer to your owner’s manual before descaling. Download our easy-to-follow guide on how to clean your single cup coffee maker.